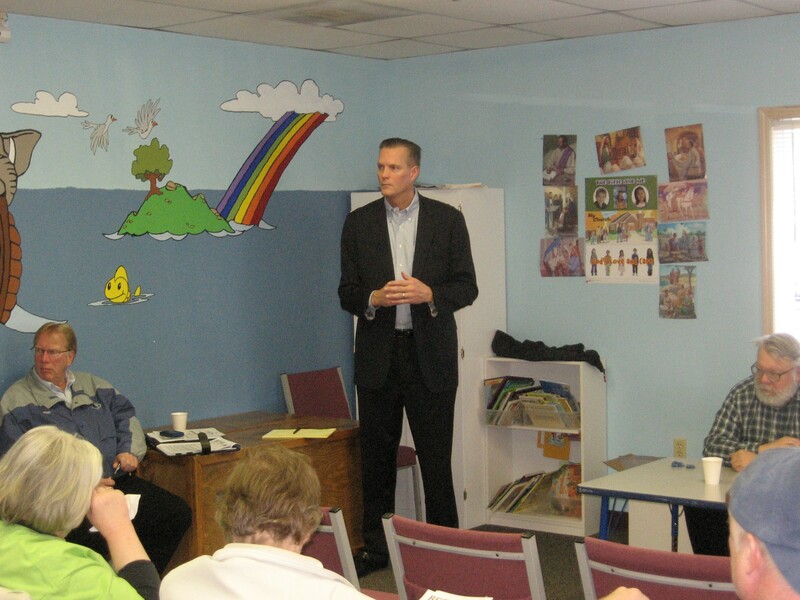 Besides announcing a slew of social and recreational programs for its residents – in particular a Spaghetti Feed fundraiser for Cross Park scheduled for April 29 – last Saturday’s Frederickson-Clover Creek Community Council meeting heard an appeal from Bethel School District for support of electronic readerboards, and Pierce County Prosecutor Mark Lindquist discussed several of his prosecutorial successes of the past year. In addition, the F-CCCC announced that the population of Frederickson has almost tripled since 2000, from 7,000 residents to nearly 20,000. Bethel’s Director of Facilities and Planning, Cathie Carlson, attended the meeting and asked the F-CCCC to endorse the district’s attempt to win approval from the Pierce County Council for an amendment to the county code that would allow the installation of electronic readerboards at every school. BSD has been pushing arduously for this amendment for over a year, and had seemingly won the battle last summer as the county council voted to permit all civic organizations to erect electronic signs. This loosely worded code change, which allowed churches, fire stations and other community-oriented organizations – besides schools – to construct this kind of signage, was vetoed last fall by the Washington State Hearing Board that oversees urban growth issues. The amendment to allow electronic readerboards is considered highly controversial, and is strongly opposed by many residents. “We could have electronic readerboards every fifty feet if an amendment like this goes through,” said Dean Absher, Vice-President of the F-CCCC and also an official with the Frederickson Land Use Advisory Commission, which is reviewing the issue, too. Others in the meeting voiced their concern, saying the electronic signs would be a distraction to drivers, or shine unwelcome lights into darkened neighborhoods. Defending her request, Carlson told the community council that the district would save money with the electronic signs by not having to send letters to parents and avoid other similar costs. “We really depend on readerboards for communications,” Carlson told the F-CCCC. Bethel currently has numerous signs at its schools and administrative facilities, but only a handful are electronic. Carlson said that the existing electronic signs are now programmed to show “only time and temperature” until the legalities are resolved. In addition to the need for an amendment for electronic signage, Carlson indicated that Bethel would also need a variance, or at least a clarification of existing code language, such that would allow the readerboards to sit atop fifteen-foot poles. Carlson said posts of this height would be necessary because the “monument-type of signs,” although visually more appealing, are more prone to vandalism. Sensing a brewing controversy, F-CCCC President Amy Pivetta-Hoffman suggested to the group that they postpone a vote on the matter until their April meeting, and in the interim discuss the issue internally – and in private. The council concurred. After Ms. Carlson spoke, Mark Lindquist took center stage. Lindquist began with a warm “Thank You,” for all the political support he received from the Frederickson area in the last election, when he was given over 60% of the vote. Prior to his election, Lindquist had been acting Prosecutor, having been appointed to the position by the Pierce County Council after long-time Prosecutor Gerry Horne retired with about a year left in his term. Lindquist said he is most proud of his department’s work in curtailing the gang activity of the Hilltop Crips. He said that 36 members of that gang were recently charged with a variety of crimes that included drug trafficking, robbery, extortion and conspiracy, and that 34 were convicted or pled guilty. Lindquist attributed this prosecutorial victory as being the product of a vigorous and comprehensive community effort, where the cops, courts and community members worked exceptionally well with each other. In addition, Lindquist declared that using a wider array of prosecutorial powers, such as charging many gang members with conspiracy – a first in Pierce County – also added weight to their efforts. Lindquist said that the next task for his office is to corral the activities of a vicious east Tacoma gang, the East Side Locos Serranos. Another success that Lindquist discussed was one started by his predecessor – the issue of Pierce County having only its “Fair Share” of released felons. This project entails having ex-offenders return to the county where they committed their crime, and not being dumped into a large urban areas such as Tacoma and the surrounding suburbs. This change in distribution has to be done by state officials within the corrections department, and required action by state legislators. The change helps many neighborhoods that had become overwhelmed with the needs of released offenders, such as employment and housing issues, drugs and alcohol dependency, and relapse into crime. “It’ll help us lower our crime rate, too,” Lindquist said. In addition, he said that the state had similarly modified its discharging programs at Western State Hospital, again relieving Pierce County of some pressures for mental health services required by these patients. Members of the F-CCCC and the audience asked some tough questions of Mr. Lindquist, in particular asking for help with an increase in residential burglaries, mail theft and property crimes. Many in attendance stressed the fact that Frederickson is the fastest growing section of Pierce County with an almost 200% growth in population since the 2000 census, and the area needs more county services, such as police. 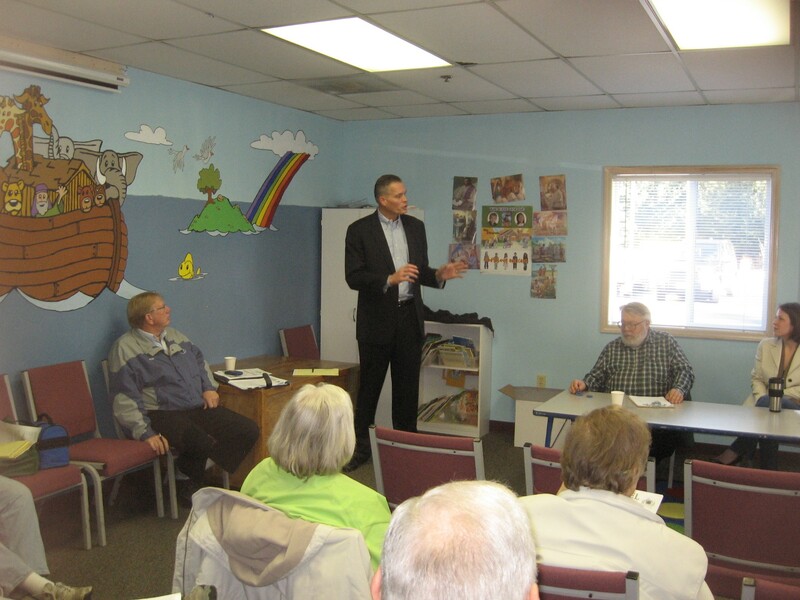 Pierce County Prosecutor Mark Lindquist taking questions at the recent F-CCCC meeting. Lindquist commiserated, but is far from the budgeting that decides policing policy. However, he did discuss the nuances of various sentencing procedures, such as determinant sentencing, which issues prison sentences based on the severity of the crime and the conviction history of the accused. “But it seems like a catch and release program,” implored Dean Absher, who did acknowledge the complexities of criminal prosecution after a lengthy exchange with Lindquist. “We have a 90% conviction rate of all cases that go to trial,” touted Lindquist, and he offered some advice for beleaguered homeowners. As for the Spaghetti Feed to help build the Cross Park on Military Rd, the festivities start at 5 pm on Friday, April 29, and will be held at Frederickson Elementary School. Adults are $8, big kids $5, and young ‘uns are free. For more information, consult the Community Calendar on the Mountain News or go to www.fsjcp.org . This entry was posted in Bethel News, Cops and courts, Culture, Events, Frederickson. Bookmark the permalink. Reader boards are offensive and inconsistent with the nature of the community.